One of the most critical parts of the personal protection equipment of soldiers is still the helmet. Statistics show that in today’s military operations, traumatic brain injury is the number one cause of death or disability of soldiers. Surveys amongst soldiers in Afghanistan revealed that most helmets are ill-fitting and uncomfortable. As a result, combat troops on patrol or convoy take their helmets off or release the chins strap for pain relief and are thus exposed to increased risk of injury. Not every helmet is right for everyone. How could it be? Not all heads are the same: It is a known fact that shape and circumference can differ greatly from person to person. Helmet manufacturers know this, but they have to work with the measurement information currently available for helmets. This is where a research project at the Hohenstein Institute in Bönnigheim, Germany, comes in: The scientists want to use the project to create the data basis for optimised textile based head protection systems. Even the safest of helmets cannot offer optimum fit and protection if it is not right for the individual head size and shape of the wearer. The research results will enable manufacturers to offer helmets with a better fit in the future. The results can be transferred to all head protection systems ranging from police and military, construction trade, to helmets for sports enthusiasts. Despite the great demand for suitable head protection systems there are no well-founded anthropometric head data available to date. The researchers at the Hohenstein Institute are using their representative pool of raw scan data from male and female test subjects as a basis for defining characteristic 3D head morphologies, creating average head shapes and soundly deriving all relevant parameters for the development of corresponding protection systems. In addition to the known head measurements from the ergonomics standard, the scientists will be taking additional measurements and evaluate these to derive characteristic head morphologies. The project will also research facial measurements and provide dimensional descriptions, meaning possible dimensional correlations between the eye, nose, mouth and ear areas. The categorising of these morphologies into representative head shapes will be an important step. 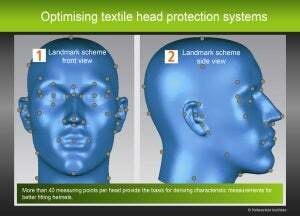 In the end, interested manufacturers will have access to specific sizing systems describing the current head and face dimensions to be used as a basis for the design of head protection systems. There will also be standardised, realistic virtual average 3D head shapes. In addition to fit-specific criteria, physiological aspects of moisture wicking have a substantial influence on wearing comfort. The materials used influence the climatic conditions inside a helmet. It is therefore important to also optimise the textile interiors of helmets with regard to clothing physiology and hygiene.